Got a little animal lover on your hands? Let him spend some time with his furry friends with this fun animal crossword puzzle. He'll name each critter pictured and write their names in the puzzle. Check out our other Animal crosswordsFor more critter fun. A Halloween crossword puzzle gets your child to practise spelling and vocabulary in a fun way. Solve this scary Halloween crossword puzzle with your child. This crossword puzzle, perfect for car trips, works on sight word recognition and spelling. Use this crossword puzzle to provide your students with practise reading words with the "bossy R."
Have your first grader fill in this colorful crossword puzzle with words associated with this thankful holiday! Get into the spirit of the holidays with this fun crossword puzzle! Your child will get to practise his handwriting skills and build his vocabulary. This fruit-filled crossword puzzle gets your child spelling in a creative way! 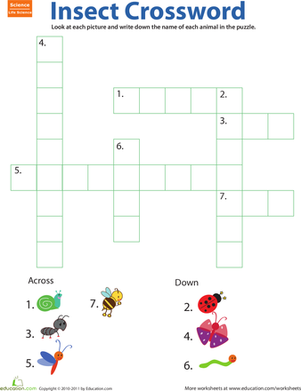 Kids will use pictures of fruits to guide their answers in this crossword puzzle. 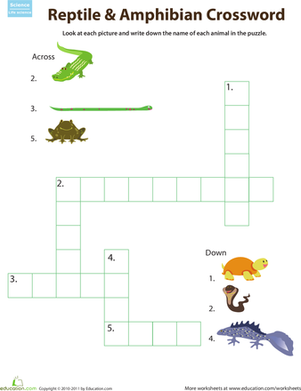 Crocodiles, snakes, and toads fill the page on this cute crossword printable. 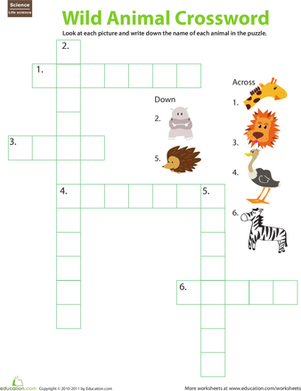 Can your child figure out each animal's name and write them in the puzzle?